Disease Diagnostic Group, maker of an inexpensive hand held device that can diagnose malaria in one minute, was named Winner of the 2014 Cupid's Cup Business Competition, a partnership between the University of Maryland's Robert H. Smith School of Business and Under Armour founder and CEO Kevin Plank. Disease Diagnostic Group, maker of an inexpensive handheld device that can diagnose malaria in one minute, was named the winner of the 2014 Cupid's Cup Business Competition, a partnership between the University of Maryland's Robert H. Smith School of Business and Under Armour founder and CEO Kevin Plank. In a last-minute twist to the ninth annual competition, Disease Diagnostic Group's founder, an engineering student at the Massachusetts Institute of Technology, accepted Plank's offer of an additional $25,000 in exchange for equity, bringing the company's grand prize winnings to $100,000. The equity will be held by Plank's Cupid Foundation, which funds the annual competition. The $20,000 second place prize was awarded to Compology (co-founded by a University of Maryland alumnus), a company that makes a sensor and software system that tracks dumpster volume and reroutes waste pickup to increase hauler's margins by 50 percent. Another University of Maryland student-run company, Wheel Shields, placed third ($5,000 prize) with a longboard skateboard accessory that improves safety, blocks mud and enables skaters to perform more advanced tricks. Joining Plank on the judge's panel were Russell Simmons, co-founder of Def Jam Recordings; Robin Thurston, founder and CEO of MapMyFitness; and Elizabeth Cutler and Julie Rice, co-founders of SoulCycle. Entrepreneur and former NFL player Dhani Jones also participated as emcee. The judges evaluated six finalists, narrowed down from a pool of 14 semifinalists who presented at Under Armour headquarters on February 20. •Encore (Georgetown University) – a company that synthesizes social data in actionable, bite-sized alerts for marketers at leading brands. •Kohana (The Johns Hopkins University) – maker of the Gala pump, a quiet, compact and discreet breast pump that allows women to pump anytime, anywhere. •Million Dollar Scholar (Morehouse College) – an ed-tech social venture utilizing a web-based platform to educate high school/college students and ex-offenders on how to gain scholarships and avoid student debt. Plank, a graduate of the University of Maryland, started the competition with the university's Dingman Center for Entrepreneurship to foster interest in student entrepreneurship. The competition is open to undergraduate and graduate-level students at accredited U.S. colleges and universities, and recent graduates of these institutions. 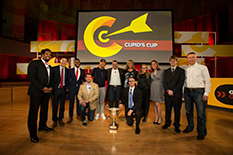 For more information about the competition, please visit www.cupidscup.com.